I wanted a variety of light pink, white & dark pink dahlias for arrangements to be placed around our venue. I was all set to head north wondering how I was going to fit it all in on the day before the wedding, then I found Carrie at Dahlia Divas. Best day and decision ever. Carrie is so sweet and her dahlias are absolutely stunning. She has so many varieties, it is hard to pick (so we just used all the shades of pink she had). You won't find a nicer person to deal with and it truly was a blessing to have someone so great to work with and so close to home. Carrie had our flowers all picked and ready for us in buckets when I arrived. Dahlia Divas prices are extremely reasonable and her knowledge of her flowers is unbelievable. I can't wait to work with her again. Thanks so much. Carrie went above and beyond for my wedding. 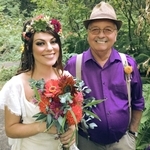 All the bouquets boutonnieres and flower crowns were Carrie's famous dahlias! Loved the warm colors, went perfectly with our fall bohemian wedding. Carrie was excellent! She met with us and gave us a lot of helpful advice. She really cared about finding out what we wanted and what types of dahlias we liked then suggested ones that were appropriate. Being able to see the flower pictures in advance on the website was invaluable! She was even there to rescue us when we needed dahlias at the last minute - because the fridge we put some of them in was too cold and damaged some flowers the day before the wedding!! We would highly recommend Dahlia Divas as the highest quality vendor in (terms of flower selection and customer service) to anyone who wants to use these gorgeous flowers for their wedding, event, or just for their beauty! Thank you so much for the wonderful flower arrangements. The flowers looked amazing and were a great addition to all our wedding photos. With little direction from me Carrie was able to develop amazing Bouquets and other arrangements that were beautiful and perfectly fit our beach wedding. Thank you so much! I'll email you photos when I get them loaded. I wanted different varieties of orange dahlias for our wedding on September 15, 2012, and I am so lucky that we found Dahlia Divas! Carrie was such a wonderful person to deal with. She picked out some amazingly beautiful flowers for me, and was even kind enough to meet me close to home and deliver them. She also had great advice for arrangements, and our wedding was absolutely gorgeous because of her help. Dahlia Divas is a great business to work with, and the kind of wedding vendor that actually makes your life easier! There are a lot to choose from - but sweet people who really care about what they do and how your event turns out are the best! The price was also incredibly reasonable, and I had enough flowers for 20 tables, 6 bouquets, and masses of corsages and boutonnieres.